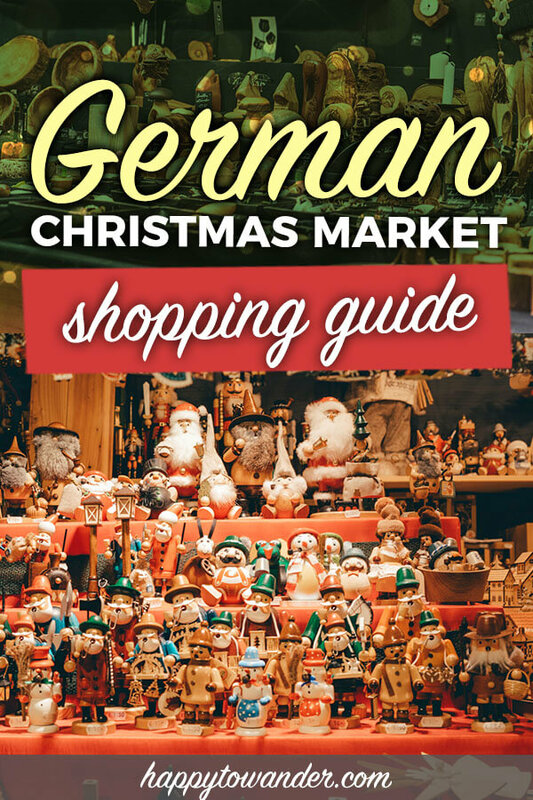 What to Buy at German Christmas Markets: Shopping Guide for Every Budget! 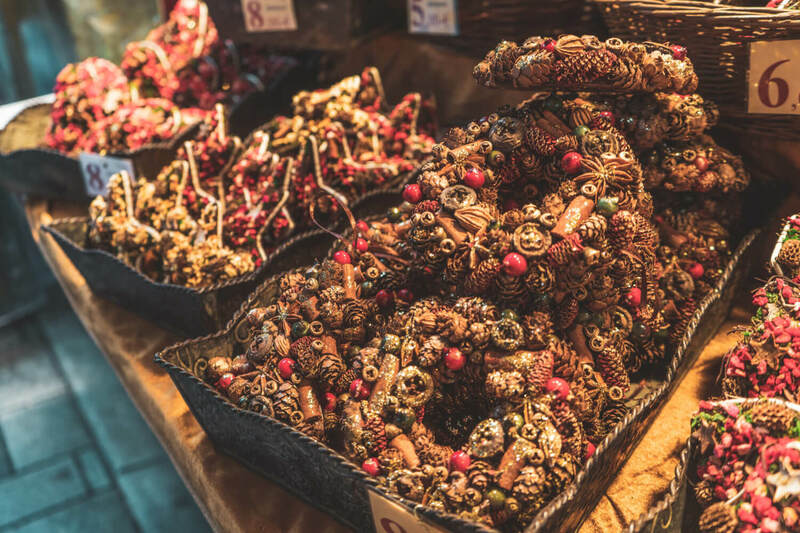 If you find yourself with the lucky opportunity to be frolicking around Europe this winter, one of the first world problems you may encounter is the difficult choice of what to buy at German Christmas markets. Having hopped around a variety of German Christmas Markets over the past three years, I’ve learned a thing or two about throwing my money at tempting German goods. 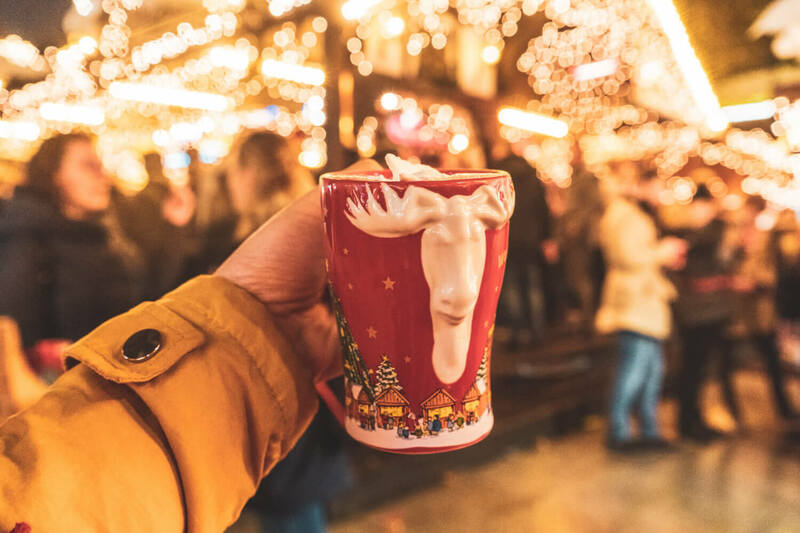 There’s definitely quite a few dos/don’ts that you learn over time, so if you’re prepping for your first German Christmas market experience this year, here’s a handy guide on shopping smartly! 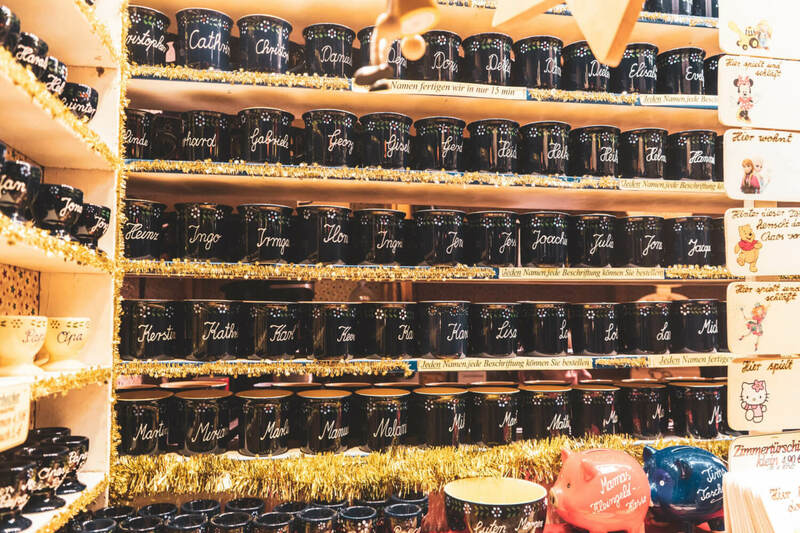 Below you’ll find a German Christmas Markets Gift guide with ideas for every price range, whether you’re looking for something on a budget or something more splurge-worthy. Enjoy! First, let’s get a few key tips out of the way. If you plan to go shopping at a German Christmas market this winter, here are a few things you should know! In good old Deutscheland, one of the things you quickly discover is that cash is king. While some vendors are more flexible in accepting cards these days, this is definitely not guaranteed and having cash on you is the best way to go! I also haven’t noticed a lot of ATMs around Christmas markets either, so be sure to bring enough to cover your expenses for the day and do a cash run before you head out to the markets. Check for a “Made in….” sticker: A lot of mass-produced goods being sold at German Christmas markets are actually made in China. Many of them will have stickers that tell you so, so if you want to double check that your sweet new nutcracker is actually German, look for a made in China sticker. Most vendors won’t have bags (or they’ll only have small ones). Sooo, definitely channel your inner Santa and bring a big bag with you to lug around your finds! 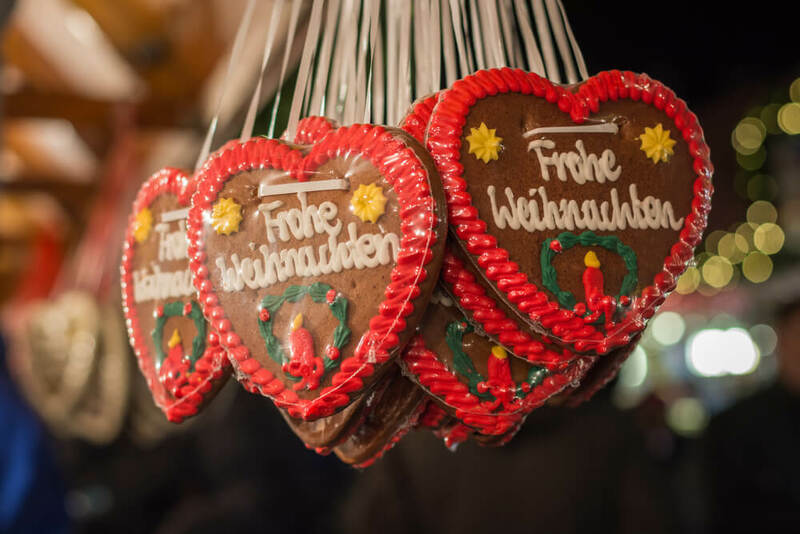 While it’s easy to lump “German Christmas markets” into one big group, the truth is there’s a lot of diversity around the country in terms of the food they serve and even the goods they sell! I’d highly recommend asking around once you arrive about specific souvenirs/products that are unique to that region. For example, quirky rubber ducks are popular around Mainz (thanks to a big rubber duck manufacturer in the area), and Nuremburg is known for its “prune people” figurines. Alright with those shopping tips out of the way, below are some ideas on what to buy at a German Christmas Market for every price range. Ornaments and wooden toys galore! Buying traditional German things at Christmas markets can often rack up a small fortune. One of the #1 souvenir items that you can bring home from your Xmas market adventure is the cute little German Christmas market mugs that you gleefully sip gluhwein from. But hey, you don’t need to be a hoarder like me! You can also give these away as gifts. One very cute gift idea that I’ve used before is I’ve taken these Christmas market cups and filled them with little chocolates and treats, then gifted them to friends and family. Not only is this a very budget-friendly gift, it’s also adorable. Trust me: everybody is easily enamoured with German gluhwein mugs, so it’s a foolproof (and thoughtful) gift. If you’re waiting until Germany to grab some beautiful Christmas cards, then you’re in luck! The markets are often stocked full of different stalls selling a variety of cards. Some stalls sell handpainted cards, others do 3D pop-up cards or even intricate cards carved out of wood. If you’re looking for a lightweight and thoughtful gift to bring home, this is a great option that’s also easy on the wallet. I think that the famous German gingerbread hearts/cookies that you see around the country during Christmas and at beer festivals are one of the best souvenirs you can bring home! 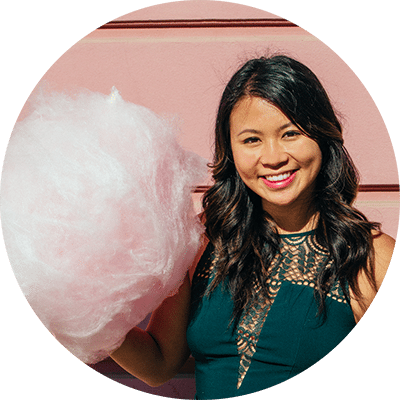 I honestly don’t love the way they taste – after all, they’re designed to look good more than taste good, so if you want a very cute (and literally sweet) gift to bring home, this is a great option. Imagine how cute this would look on a tree! 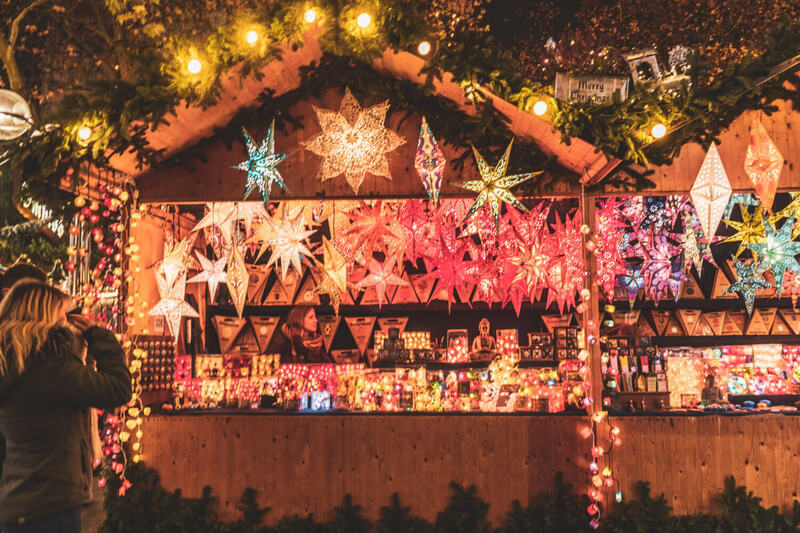 Besides delicious eats to consume on the spot, Christmas market food stalls will often have specialized products that you can bring home with you. If you’re shopping for a foodie (or for yourself), there’s no gift better than a local food product they can’t get at home like special spices, jams, chutneys, spreads, etc. Okay so I have to admit, I have a mild obsession with these paper stars. You see them at every Christmas market and they are absolutely gorgeous. If it were up to me, I would cover my house head to toe in them. They make for a wonderful gift to bring home just because they fold up easily and travel well without fear of getting smashed or ruined. NOTE: The light usually doesn’t come included though, so be sure to inquire about that if you want a light with yours. Someone get me a bigger suitcase, stat. I have a winter wonderland to create! I love walking around German Christmas Markets, staring at old wooden toys and imagining a simpler time when 8 year olds didn’t have iPhones. Sure, I grew up in an age of screens and probably never played with wooden toys (I was more of a Neopets girl) but hey, the German Christmas toys you find at these markets are really something else and offer a little pang of lovely nostalgia. At every market, you’ll find plenty of huts with different toys like wooden figurines, metal puzzles, and more. Definitely a great idea for a unique gift to bring home for kiddos! Who needs an iPhone when you have a cute German elf? If you’ve never considered yourself a “candle person”, just you wait. I don’t know what it is about German Christmas markets that make me crave an irrational amount of candles, but wow. 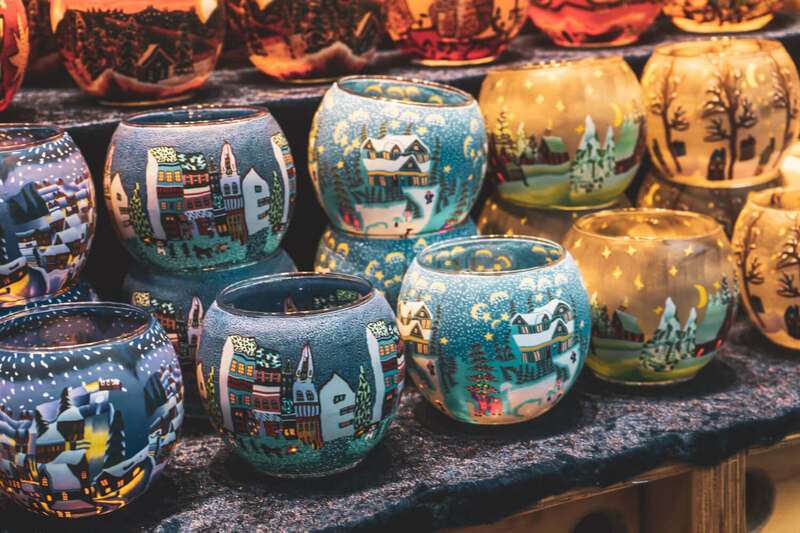 From intricately carved candles that look like corn on the cob to beautifully hand-painted glass candle holders, you’ll find a huge variety of candles/holders at every Christmas market, and they make a wonderful souvenir to bring home. Trust me, these are always a hit! Now here’s a personal favourite gift of mine to bring home from German Christmas Markes: liquor! Seriously though, local liquor makes for a great souvenir and gift, whether for yourself or for a booze-loving friend. At most markets, you’ll find little stalls selling liqour in charming little bottles in varying shapes and sizes. Definitely a great, simple gift idea. You can even buy small ones that fit into your carry-on. I see many of these stalls around Bavaria, and I think everyone in my family owns a pair of sheepskin slippers by now. Clearly, I’m weak. But seriously though: the handmade sheepskin products you find around German Christmas markets are impossibly soft and one feel later, you’ll be throwing your money at the vendor. 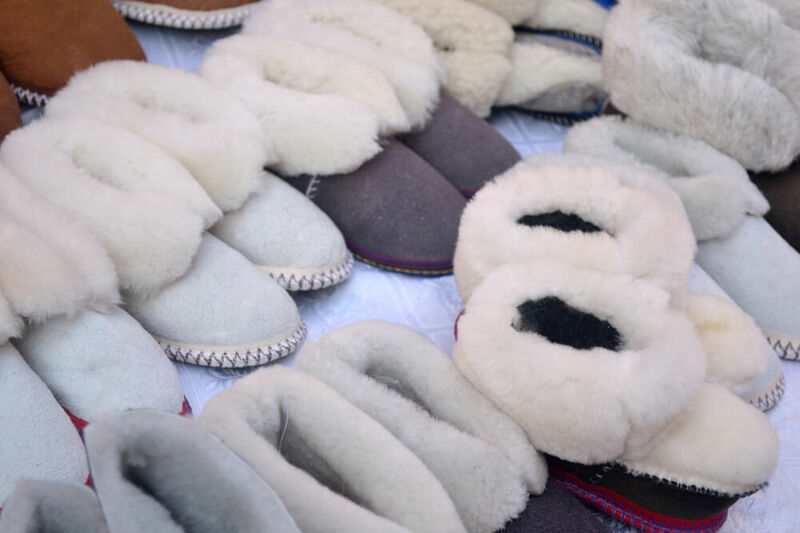 From cloud-like mocassins to big, stylish coats, German Christmas market stalls have plenty of options that make for awesome, unique gifts. Alright, not the most practical gift to bring home, but so charming I couldn’t include them. 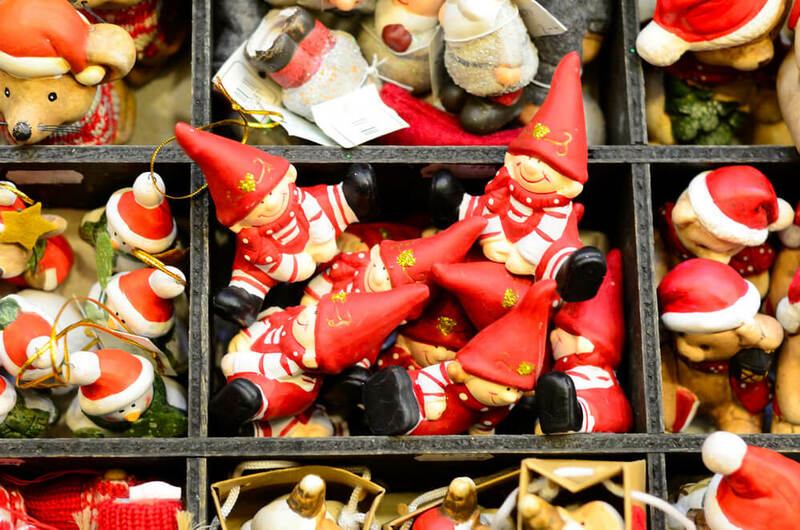 These porcelain Christmas village figurines are a ubiquitous sight around German Christmas Markets and they are a delightful souvenir to remember your trip by! 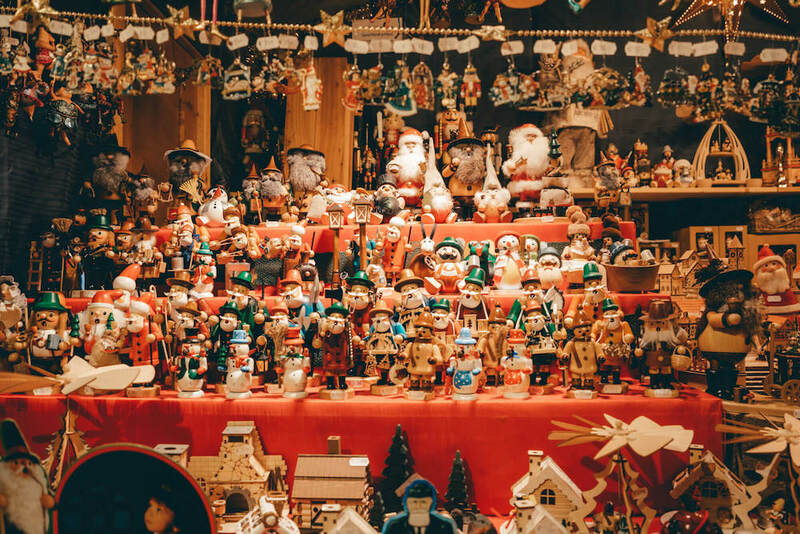 These German Christmas village decorations are really cute and often you’ll find some that are modelled after famous tourist attractions, so they’re a great way to remember your trip. 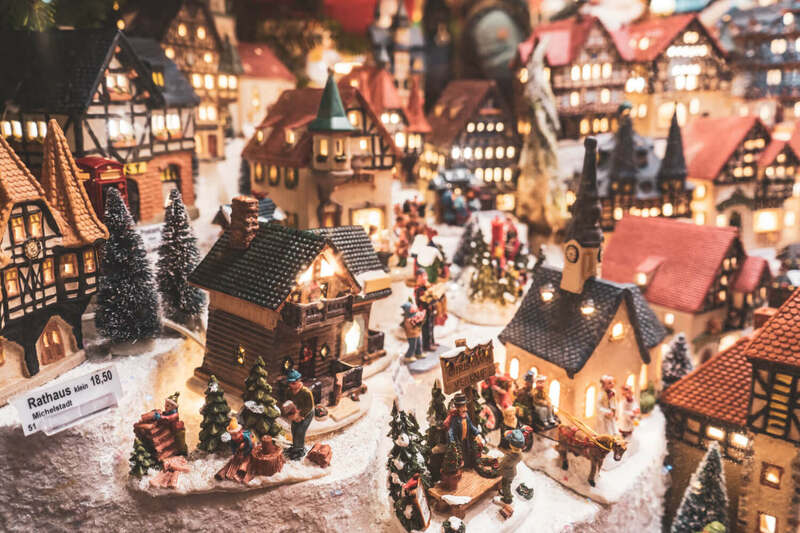 They run at about 20 euros each, so you could easily rack up a big bill if you’re planning on assembling your own little Christmas village, buuuut how worth it would that be?! 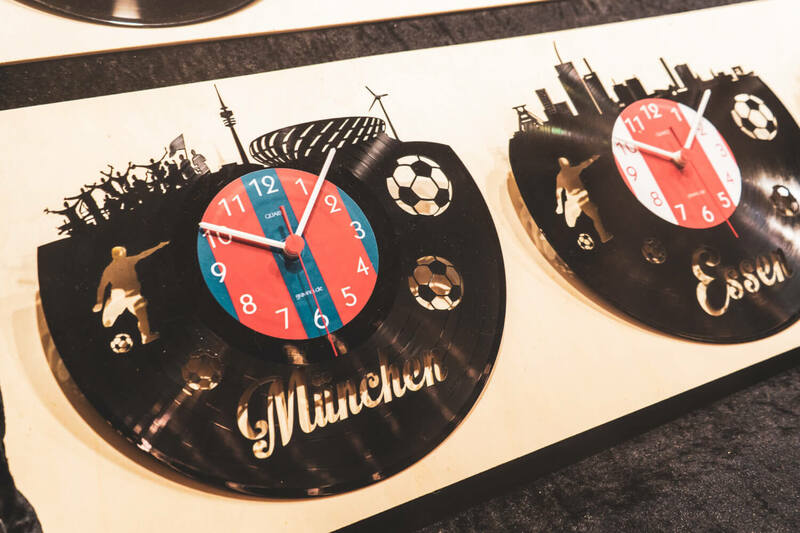 At every Christmas market there will usually be a stall that sells some kind of personalized item, whether it’s painted mugs or customized wooden cutting boards (like the ones pictured below). They’re usually personalized on the spot (these mugs for example take about 15 minutes) and make for a really thoughtful gift! These might be a little tricky to bring home, but German Christmas markets always have stalls selling lovely (and often unique) tableware. I love looking at the Christmas market stalls selling all sorts of wooden creations. 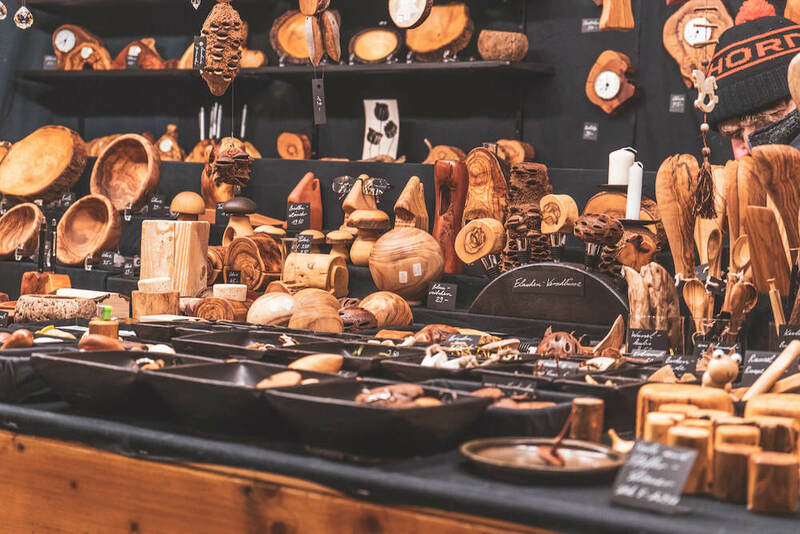 From cutting boards and intricately carved bowls to creative bottle opener and corkscrews, these always make for unique and wonderful Christmas market gifts. Honestly, browsing any of these stands inevitably makes me want to buy a cabin. Woodn’t you like to buy some of these? One of the highlights of my Christmas market shopping is staring at all the shiny objects. I of course mean jewelry! There are always several beautiful stands selling unique, hand-made jewelry and this would definitely make a lovely, thoughtful gift for that someone special in your life. NOTE: The jewelry (and leather goods) on display at German Christmas Markets are often the ones most likely to be mass-produced, so if you’re looking for something unique and handmade, here are a few rules of thumb: ask yourself if you’ve seen similar pieces at other Christmas markets around, check for any “Made in China” stickers or even just ask the shopkeeper yourself. Time to spend all your money…! Any more questions about what to buy at a German Christmas market? Previous ArticleThe Princess Switch Filming Locations IRL: Where to Find the Princess Switch Castle, Belgravia & More!